The news has been abuzz before and during the ceasefire announced amid Syria’s conflict about Saudi Arabia’s possible intervention. Saudi Arabia has threatened to intervene amid incomprehensible, contradicting rhetoric, claiming that it would enter Syrian territory to “fight” IS (the Islamic State), but would do so only now because the Syrian government has refused to step down. Armed forces from 20 countries have begun manoeuvres in northeastern Saudi Arabia, described by the official Saudi Press Agency as one of the world’s biggest military exercises. Troops from the other five Gulf Arab states – the UAE, Bahrain, Kuwait, Oman, Qatar – as well as Pakistan, Malaysia, Turkey, Egypt, Morocco, Jordan and Sudan are among those participating in the Ra’ad Al Shamal, or Northern Thunder, exercise, Spa agency reported. The military drill – which began on Saturday and involves ground, air and naval forces – will be “one of the world’s most important military exercises based on the number of forces participating and the area of territory used”, the agency said. While that sounds impressive, with Saudi news outlets claiming some 350,000 troops were expected to participate, not a single photo or video has surfaced so far showing this impressive force in action. The entire point of mounting such monumental military exercises is to show off one’s military power to the world, not merely write about it in news articles. And more specifically, in Saudi Arabia’s case, such exercises are meant to show those nations it is trying to coerce by threat of military force just what it faces if concessions are not made. Not much is known about the proficiency of Saudi Arabia’s military as a fighting force. The only real war the Saudis have taken part in was Operation Desert Storm in 1991; and most of the fighting there was done by the US. More recently Saudi Arabia has been fighting in Yemen, but unsuccessfully so far. Foreign advisers speak about the difficulties in bringing Saudi Arabian soldiers to the desired combat readiness and proficiency. 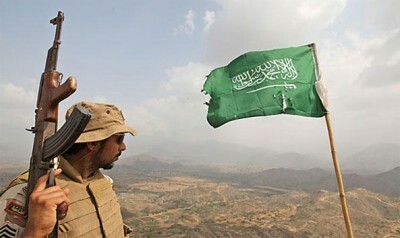 The article also mentions another key shortcoming, Saudi Arabia’s overdependence on foreign soldiers filling its ranks and the high number of contractors it relies on, as illustrated in its ongoing war with neighboring Yemen. There are several complications that immediately undermine Saudi Arabia’s threats. It’s one thing to have an army, but it’s another thing to actually get it into another theater of war that isn’t bordering your own nation. Moving troops into Syria will require the cooperation and complicity as well as additional logistical expertise of other nations to move troops from Saudi Arabia either through Jordan and into Syria, or in large numbers to Turkey by sea and then onward to Syria. And, it is one thing to have such capabilities to move enough troops for any sort of meaningful incursion into Syria, and quite another thing to be able to keep them armed, fueled and otherwise supplied, especially during sustained combat operations. However, this last point could be addressed by Saudi troops simply latching on to the supply lines already in place for Al Qaeda and IS, lines likely already very familiar to planners in Riyadh, since they have helped underwrite them to begin with. Still, the unique requirements for a modern, mechanized army would need these lines expanded and augmented, something Saudi Arabia has little experience doing. And experience is perhaps a third failing Saudi Arabia brings with it when it tries to threaten other nations of invasion. Entering into the Syrian conflict and doing anything more than seizing a buffer zone at the edge of Syria’s territory would be the first “rodeo” of its kind for Riyadh. And if such a move was considered a “rodeo,” its move into Yemen next door could be considered a “junior rodeo,” and one Riyadh has yet to finish. If Saudi Arabia cannot even win on the battlefield in neighboring Yemen, with fighting even spilling over the border into Saudi territory, it is unlikely it will do any better against the battle-hardened, better organized and better equipped forces of the Syrian Arab Army, let alone Russia’s presence in the country. Clearly Saudi Arabia’s phantom military exercises and posturing are cover for something else. It is likely that anything that goes over the border into Syria under the Saudi flag will be anything other than actual Saudi forces. Remember those Al Qaeda and IS supply lines mentioned earlier? What if the fighters and equipment pouring into Syria simply changed their black flags to Saudi Arabia’s? And though Saudi Arabia’s demands for “democracy” in Syria despite the fact that Saudi Arabia itself is an absolute monarchy devoid entirely of elections, staged or otherwise, are particularly discredited, an undeserving air of legitimacy still surrounds the regime in Riyadh, perhaps enough to make it difficult for Syrian or Russian forces to attack terrorists flagged as Saudis. Consider also that while moving thousands of additional troops into the theater may be difficult, moving Saudi warplanes is not. Many are already reportedly in Turkey, standing by for operations. Saudi-flagged terrorists backed by Saudi airpower would be a particularly potent mix that could keep supply lines to terrorists fighting in Syria’s interior open long enough to break Syrian-Russian operational momentum and create a stalemate only tough concessions made by Moscow and Damascus could break. With this possibility, it would benefit Syria and its allies to begin considering a true no-fly-zone over the country, excluding from Syrian airspace all nations (especially the Saudis and Turks) not given authorization by Damascus. The matter could be brought before the UN under the plausible pretext that Syrian troops are closing in on IS positions in Al Raqqa and the chance of mishaps are growing by the day. This is not even a ploy, because in fact, Syrian forces are closing in on Al Raqqa. Now would be as good a time as any to begin closing off Syrian airspace and helping the US and its allies back down from increasingly desperate options, saving them from themselves and their demonstrably bad judgement. Ulson Gunnar, is a New York-based geopolitical analyst and writer especially for the online magazine “New Eastern Outlook”.